Apples and cherries should just get married, they’re so perfect together. 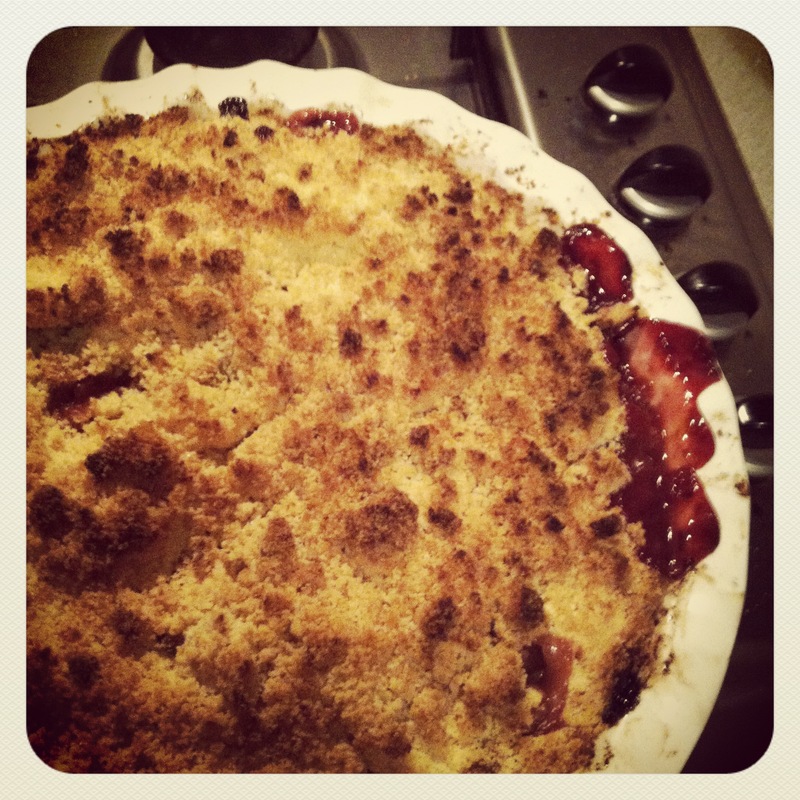 I enjoy eating this crumble so much, and have been making it fairly regularly through Winter and into Spring. It is friendly to variations like subbing out either of the fruits for apricots/blueberries/rhubarb (with extra sugar)/plums/peaches but the cherry and apple combo is my favourite. You can leave the apple peel on if you like (as I’ve done here), but if you’re being fancy, or like me you enjoy it when the fruit collapses all willy-nilly into itself, then peeling the apples is your best bet. Grab a large pie dish, using one of the cubes of butter, rub all over the inside of the pie dish and lick your buttery fingers. In a small bowl mix the brown sugar, cinnamon, ginger and cornflour, using a fork to break up any lumps. Peel, core and chop the apples into about a 1 inch dice (or the size of your cherries). Squeeze half of the lemon over the apples to stop them from browning. If you are using fresh cherries, wash and pit them. If you are using frozen cherries, give each of them a quick squeeze as you drop them into the bowl to make sure the pit has been removed. 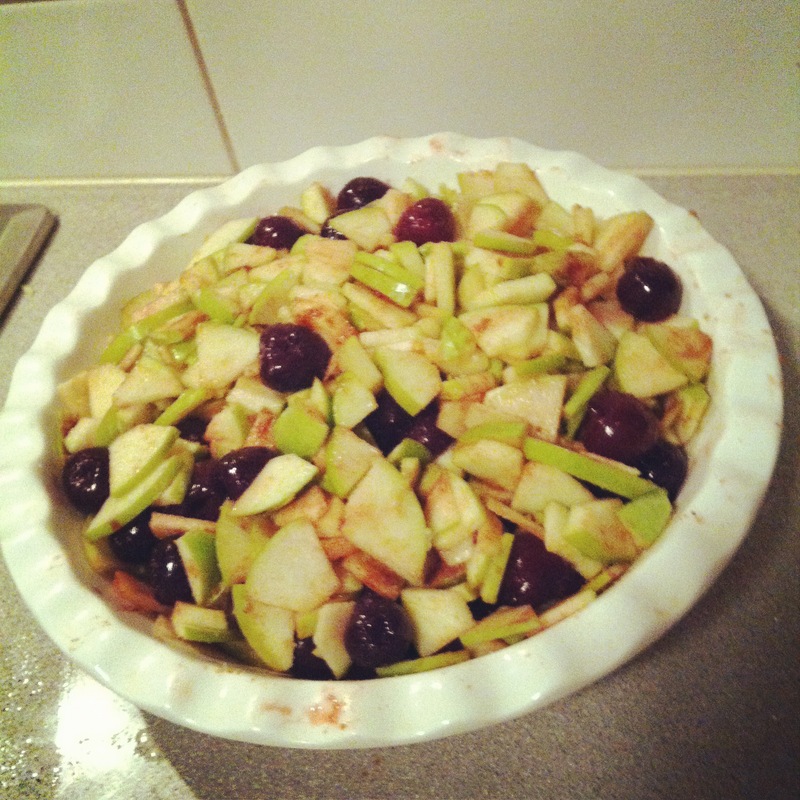 In a large bowl, combine the lemony apples, cherries, and the sugary spiced mixture. Using your hands, mix gently to coat the fruit. Pour the fruit ino the buttered pie dish. Push it down so that there is a small lip around the edge for the crumble to sit in and then you really want the fruit to sit up above the lip a little in the middle, so mound it up, as it will collapse a bit during cooking. I was trying to be fancy and cut the fruit into thin slices, don’t be like me, it went to mush. Boo. Add the flour, sugars, cinnamon and butter to a bowl. Using your fingers, rub the butter into the flour until you have a sort of rubble texture. Carefully pour/plop/pat this on top of the fruit mixture. Pat down firmly. Set pie dish on a tray/cookie sheet covered in baking paper and put into the middle of your preheated over for 25 – 40 minutes. If the top starts to brown too much, remove the crumble from the oven, break the topping up a little and then place back into the oven (this lets ALL of the crumble bits have a chance to brown). this needs to come to my mouf. I love this recipe. Never made crumble before and now I make the best one I have ever tasted and all thanks to you, nfl. My girlfriend was super impressed with it, makes me make it every day. And is now fatter for it!! hehe. But she is even sweeter!! Thanks, Katie. I only had 80g of butter, when I made the crumble yesterday evening. So I used 60g in the crumble mixture and brushed over the last 20g and got a rich golden crumble top.